"The city of New Orleans is formed into the shape of a crescent, which is believed by many people to form a sacred chalice which holds and stores energy making it one of the most unique areas in the world in which to perform magic and to see it magnify due to the energy in the land and from the flowing waters of the Mississippi and Gulf of Mexico.Since childhood, Kala Ambrose has seen and felt ghosts and restless spirits. 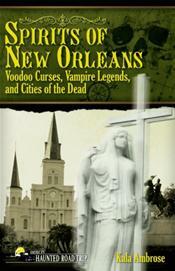 During this journey as your travel guide, Kala explores the history of the city and those who decided to make it their eternal home.Explore New Orleans with Kala Ambrose and prepare to embark on a unique and enticing journey into the haunted history and magical ceremonies of New Orleans. Prepare to be introduced to supernatural rituals and practices in order to fully understand and embrace the cultural significance of the variety of beliefs, superstitions, legends and lore."